Somewhere on the all-time list of link-bait titles, below Listicles, Top Trends and One Weird Trick, is an irresistible lure for professionals: Buzzwords You Must Stop Using. These posts always promise a good eye-roll. You can laugh along at the sheeple who spout trendy words (while discreetly taking stock of your own vocabulary), and when you share these posts, your likes and comments inevitably pop, with everyone sharing their own annoying examples. Beyond the odd contradiction of these articles (you’re no less a sheep for letting others influence which words you shouldn’t use than the sheep who are using those words in the first place) there’s a good reason to pay more attention to buzzwords than to be irritated by them. In the same way data-mining statisticians will count keywords to identify important trends, buzzwords can be a useful marker of important market signals. Even when they’re flowing from the mouth of a droning sales rep. Here are three massively overused buzzwords that may sound like they have lost all substance when spoken around a conference table, but actually signify something vital. People have been complaining about this overused buzzword since the late 90s. Why do people say “solution” when they really mean just a product or service? The use of “solution” to describe business offerings caught fire in the IT industry because it marked a major shift from selling hardware and software that buyers would install and integrate on their own to selling packages of technology and services that made it easier for buyers to use without their own engineering. A technology “solution” signifies a more complete package that makes it easier for the buyer to achieve the intended business objective. For example, if you wanted to have corporate email back then, you’d have to buy a server from one vendor, email software from another vendor, and have your IT guy install and manage it. Today, an email “solution” allows you to be up and running with nothing required but configuring your accounts. Part of what makes “solution” confusing is that its exact meaning is often contextual based on the business problem being solved—and yes, it is often used to make an offering sound like more than it really is. But the important thing it signifies is an ongoing simplification of technology components into more complete packages that make it easier for the buyer to achieve the intended business objective. You can blame social media for the “engagement” meme. Again, it’s a word so overused that it often seems meaningless, but it signifies a monumental shift. Before the rise of social media, the focus of most business technology was transactional. Connect with a customer, place an order, track a shipment, take a payment. In fact, business was so transaction-minded, pundits like Peter Drucker talked about manufacturing customers. If you just organized the right marketing processes and campaigns, you could predictably churn out customers and revenue just like you churn out widgets, as if people were just raw materials to be turned into buyers with industrial efficiency. The popularity of “engagement” points to a growing demand from buyers to be treated as more than transactional commodities. People only really started talking about “engagement” as social media rose in popularity, and buyers started ignoring the transactional sales messages of big brands and started listening instead to the brand experiences discussed by friends and peers online. Suddenly email marketing became all about “nurturing” relationships, and connecting with buyers involved a lot more dialog, measured through comments, likes and follows on the way to sales. Sure, sales reps may use “engage” to make their products sound more interesting and exciting, but the reason so many people feel so compelled to use it isn’t a fluke. It signifies a shift from the treatment of customers as commodities to be efficiently mined to a growing demand from buyers to be respected and treated as human beings. This is one hits close to home, because my company provides a Sales Enablement solution. 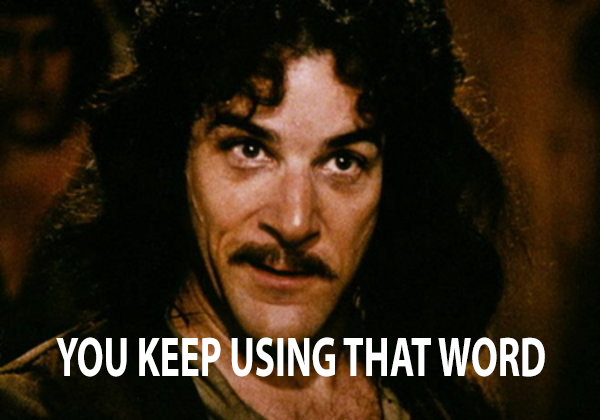 And yes, I often hear people push back on “enablement” as just another meaningless word meant to sound important. But like the other words on my list, it signifies something much deeper. It’s not a stretch to say that most of the technology underwritten by investors historically has focused on “automation”. Humans are expensive. They require training, salaries, benefits, hourly limits on their workload, and they tend not to scale well. Replacing humans with software and robots consumes an enormous portion of our market resources. In a world moving rapidly toward automation, “enablement” signifies technology that enhances rather than replaces human capabilities. But as advancing “solutions” shift more of our focus from making technology work, and more toward gaining the business value from the technology we deploy—the more we shift from hardware and software to “everything as a service”—the more we’re beginning to appreciate the ways that many solutions need humans. Artificial Intelligence, machine learning and NLP are all fantastic technologies that will help us achieve great things. But the power of these tools is often not in replacing humans with automation, but in enhancing human abilities to be smarter, faster and more effective in carrying out their business decisions and tasks. This is indeed “enablement”, and it stands in stark contrast to the overwhelming demand to automate. None of this is to say that buzzwords aren’t often overused, or used to imply greater importance than is deserved. But rather than being annoyed at the use of buzzwords, put on your data analyst hat and ask yourself what signals the trending use of a buzzword might convey. Even though the person telling you they have a sales enablement solution to engage your customers sounds clueless about what they really mean, the small statistical likelihood of so many people landing on those same buzzwords independently probably points to something more substantive. And if you’re not convinced that sales person knows what they’re saying, just ask: What do you really mean by that? The answer may have more meaning than you expect.